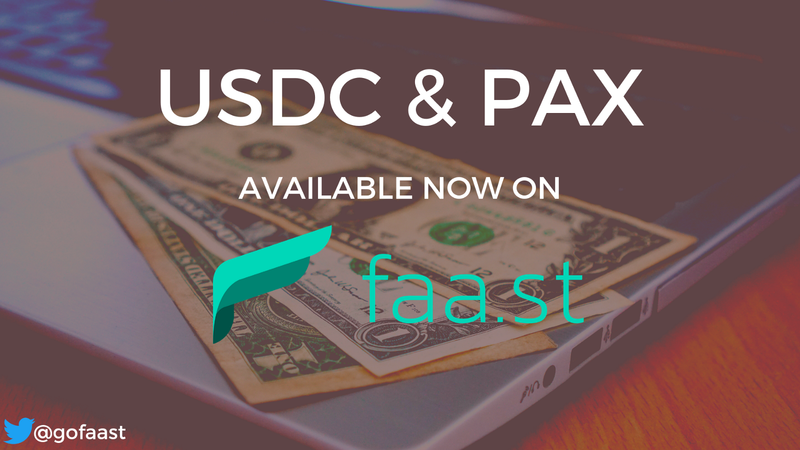 We’re proud to announce that USD Coin (USDC) and the Paxos Standard (PAX) stablecoin are now available on Faast. In the midst of a harsh bear market, interest in stablecoins has increased. During times like these, it’s not uncommon for stablecoins to be in the green on CoinMarketCap when virtually everything else in the red. Stablecoins offer protection against wild fluctuations in the prices of digital assets, and for this reason, we wanted to offer more options to our users. Today we’re going to explain a bit about USDC and PAX, and how Faast offers an easy and frictionless way to convert some of your holdings into these stablecoins. USDC is a US dollar-linked stablecoin built by Circle. Similar to TrueUSD, USDC is an ERC20 token allowing for movement of US dollars quickly and almost instantly, including outside of normal banking hours. The team behind USDC places high importance on transparency. Before new USDC can be created, the equivalent amount of fiat US dollars must be deposited with one of their banking partners. Their holdings undergo monthly attestations by Grant Thornton, LLP, and are posted on their website. USDC made headlines recently when Coinbase chose to list it on their platform, making it the built-in stablecoin for both Coinbase and Coinbase Pro. USDC has since quickly established itself as one of the most popular stablecoin choices. PAX is also a highly-regarded ERC20-based USD stablecoin, and at the time of this writing, is neck and neck with USDC in terms of market capitalization. One thing that makes PAX unique is that was specifically built by a team with experience in the financial world prior to getting into the cryptocurrency industry. Paxos is a Trust Company based in New York and is subject to that state’s thorough financial services regulations. As such — you can rest assured that they’re doing everything by the book. Like USDC, attestations of PAX US dollar holdings are posted online each month. Now you can now easily add USDC and PAX to their portfolios with Faast swap, or by connecting your wallet to Faast. As ERC20 tokens, both USDC and PAX can be stored in any ethereum wallet, including hardware devices like trezor and ledger wallets which support the ERC20 standard. Swapping BTC for USDC with Faa.st. To connect your wallet, just visit https://faa.st/app/connect, select your wallet, and begin swapping right away! No accounts, waiting periods or aggravation required. When you’re ready to jump back into the market, you’ll have USD ready to go, safe and sound on your wallet that only you control. You can easily add PAX to your portfolio using our “Rebalance” tool. Visit our Supported Wallets page for step by step instructions on how to use Faast with your wallet.